Frosty mornings mean temperatures are falling below freezing overnight, and winter is well on its way. 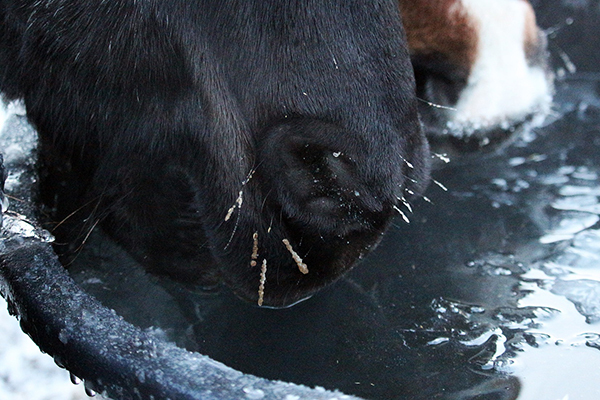 Keep your horses, livestock, and poultry hydrated with help from heated buckets and de-icers. Fresh water is crucial to your animals’ health throughout the year. Even though it’s anything but hot outside, they can still quickly get dehydrated. If their water is frozen or slushy, they may choose not to touch it. In addition, simply breaking the ice at the surface can even cause the ice to re-freeze even thicker. Heated buckets and de-icers are cost-effective solutions. They’re re-usable year after year, and they can help conserve water in the long run. They will only turn on when the water gets close to freezing temperatures, so they can be left plugged in and only use electricity when needed. These heated buckets are the size of a standard muck tub. They’re an excellent option for run-ins, livestock paddocks, or even in stalls for horses who drink a lot of water while inside. They sit right on the ground – no hanging required. These buckets are great for all livestock and horses. They keep the water just above freezing and will only turn on when needed. They also feature no chew cords. These make it easy to keep your stock tank available all year. Sinking or floating de-icers are easy to remove for cleaning. Some stock tank heaters screw right into the tank’s drain, making it less likely to be tampered with by one of your animals. Some bucket heaters do actually heat the water to make it hot. These are for mixing warm soaking feeds or milk replacers. Keep your livestock, small animals, and poultry hydrated. Shop all Heated Buckets & De-Icers. We made a simple solar heated trough. It’s pretty much a wooden box that covers the entire trough, with a large cut out of the top, so they can access water, a small cut out at the drain, and a “window” on the eastern side of the trough (where sun rises) so sun can shine through. It has insulation. The insulation is just old jeans and darkly colored clothing/blankets. If we lived in a severely cold climate, I’d use legit insulation. Some people use a cooler lid over the hole in the top where the horses drink, so that there’s less air-cooled area over the drinking hole. They “mash” the lid down when they drink but it pops back up afterward. Easy, no electricity involved, no chance of it getting unplugged or the cord wearing out. Google solar troughs. Fascinating stuff. Leave a Reply to Kc Click here to cancel reply.